The New York City lawyer who was shamed publicly on social media for his xenophobic rant toward Spanish-speaking restaurant employees has apologized. In a Twitter post Tuesday, Aaron Schlossberg says the experience has opened his eyes and claims he's not a racist. 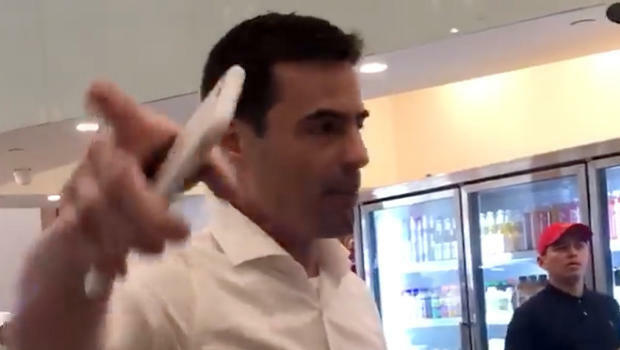 Last week, the Manhattan-based attorney unleashed an angry tirade against Fresh Kitchen employees because some of them spoke to Spanish-speaking customers in that language. The encounter, which was caught on video, quickly went viral and ignited a massive backlash online. Schlossberg's name even became a trending topic on Twitter. In the minute-long video, Schlossberg said he would be calling Immigration and Customs Enforcement (ICE) to have the workers "kicked out of my country." He complained to another restaurant worker that "it's America" and that in a Manhattan eatery "staff should be speaking English." Schlossberg also presumed that the workers were on welfare paid by his taxes. Yet, despite his words in the video, Schlossberg says that's not the real him and insists, "I am not a racist." "To the people I insulted, I apologize," Schlossberg tweeted. "Seeing myself online opened my eyes -- the manner in which I expressed myself is unacceptable and is not the person I am. I see my words and actions hurt people, and for that I am deeply sorry." His comments in the video footage led to a flurry of local reactions. He was kicked out of his office space and faces a complaint from two elected officials. There was also an online fundraising campaign which brought a mariachi band to accompany demonstrators outside Schlossberg's Manhattan apartment over the weekend. Schlossberg addressed that too. "While people should be able to express themselves freely, they should do so calmly and respectfully," he said, though few would characterize his conduct on the video as calm or respectful. His Twitter message also expressed his "love" for immigrants and diversity in New York City. The social media furor led internet detectives to turn up more instances of a man who appeared to be Schlossberg getting irate with others. One clip was posted to YouTube in October 2016 by a man who said Schlossberg attempted to shove him on a sidewalk before threatening to call the police, and another from May 2017 showed him berating a group of Jewish protesters who were speaking in support of a Palestinian-American activist.